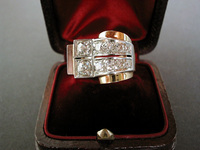 Superg and elaborate late Art Deco 1940s RETRO style diamond ring crafted in 18 karat yellow gold and platinum. The ring is set with a total of 10 brilliant cut diamonds with superb D-E color and VVS clarity and total estimated diamond weight of about 1.20 carats. The two largest diamonds are of about 0.30 carats each. Gross weight of ring is 8.4 grams and has a size 48/49 (US size 4 3/4, UK size J). Most likely a French manufacture. Scarce antique jewelry / jewellery collector piece from the 1940s Art Deco Retro fashion era and one of the great Retro type diamond cocktail rings and jewels.